The Arabic Republic of Egypt in North East Africa— the land of Pharaohs and pyramids fascinates with its mighty monuments from the ancient Egyptian era and the amazing diversity of animal life along the Nile. At an immense 6671 km in length, the Nile rises in the mountains of Rwanda and Burundi and discharges into the Mediterranean. On its long journey it flows through the states of Burundi, Rwanda, Tanzania, Uganda, Sudan, and Egypt. The best time for the adventure of a Nile River Cruise is between October and April. Starting in Luxor you are immediately confronted with one of the absolute highlights of Egypt: what is probably the world&apos;s largest religious temple complex: the Karnak temple. You can also admire the mystical Valley of the Kings, Egypt&apos;s necropolis, in which the ostentatious cliff tombs of the rulers of the New Empire are to be found. 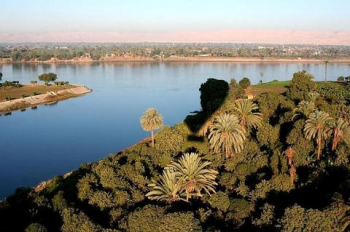 The Nile River Cruise then takes you on to Edfu. This is the starting point for a visit to the country&apos;s best preserved temple, the Temple of Horus. In Kom Ombo you can see the symmetrically laid-out "double temple". The camel market is also worth visiting. Further to the South, Aswan, with its 4 km long and roughly 111 m high dam, is a particularly interesting tourist destination on the Nile River Cruise. The journey then continues across the world-famous reservoir, Lake Nasser to Abu Simbel. This is the site where Egypt&apos;s most important building, the mighty cliff temple of Rameses the Great, the Temple of Abu Simbel, was built. Four gigantic 21 m high statues of the Pharaoh are enthroned at the temple gate as if to protect it. You have a broad range of boats at your disposal for this trip. On one of the specially constructed riverboats you will be able to enjoy excellent service and comfort in a homely atmosphere, treating yourself to selected culinary delicacies.